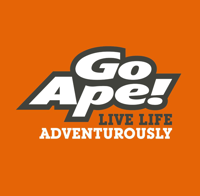 Release your little monkeys on to a Go Ape course designed for them. No one loves adventure more than kids! If you’re looking for outdoor activities for children, then Go Ape’s got the answer. It’s a fun filled hour of canopy exploring, trail blazing and obstacles for all to enjoy. You’ll negotiate crossings and finish on a high (literally) with one awesome zip wire. Something for Everyone. NEW Tree Top Junior at The Lookout in Bracknell.
. Whether you’re wanting to ‘monkey around’ in cool adventure playgrounds, ride through the forest on the great bike trails or enjoy our ‘classic’ Tree Top Adventure, you’ll have a wonderful day out. The Lookout in Bracknell is home to our original Go Ape Tree Top Adventure. We’ll brief you for safety before you fly down our zip-wires, leap off our Tarzan Swing and tackle our obstacles whilst enjoying some breathtaking scenery. If you’re looking for outdoor activities for children, then Go Ape’s got the answer with Tree Top Junior. Fun filled days out of canopy exploring, trail blazing and obstacles for all to enjoy. You’ll negotiate crossings and finish on a high (literally) with an awesome zip wire. You will be just an arrows flight from where the opening scenes of the Gladiator were filmed. If your already at the lookout why not make a little educational trip. get your little ones a book or worksheet and help them identify the trees you find. We love packing these and hunting for all the things on the cards. We love packing these and hunting for all the things on the cards. The children have little bags for collecting the items. These are great for allowing the kids to easily see what they have collected so far. The open areas lend themselves to a bit of bird watching. This kit contains everything you need to take your family bird watching, including bird identifcation cards and binoculars. Bring the Tribe and Enjoy a Birthday to Remember. We’re a great option for a ‘never to be forgotten‘ birthday party. If you have a group of under 10’s then our Tree Top Junior adventure is a great option. Release those little monkeys onto a Go Ape course designed for them. No one loves adventure more than kids! They’ll enjoy up to an hour of canopy exploring, trail blazing and obstacles. Our latest adventure is for anyone 1 metre and over, and costs £18 per person. We don’t require adults to accompany over 6’s on the course but you are more than welcome to book yourself on. You will be required to supervise from the ground as after the safety brief we leave to enjoy the course, but don’t worry an instructor is always nearby. What People are Saying: “My son had his 8th birthday party at Crawley Junior Go Ape and he absolutely loved it!! All his friends thought it was the coolest birthday they had been to. The staff were great and really helpful when some of the children got a bit nervous while up there. A great place to take the kids and it does wonders for their self esteem!” Suzanne, Crawley. Juniors (6+) – Are able to participate on the course unaccompanied, although adults are welcome to join them. Participating Juniors over 6 years old require at least one adult per group of 6 to supervise, either on the course (paying) or from the ground (no charge), for the duration of the activity. Children (under 6 years) – Must be accompanied on the course by a participating Adult, one Adult can accompany 2 under 6s, although we strongly advise 1 to 1 on the Child’s first visit. A Party Bag containing a medal, a Yo Yo, a pencil set, pencils, a monkey mask, stickers and their very own certificate of achievement. A T-Shirt for the Birthday Boy/Girl. Pre-order a T-Shirt in sizes 6-7, 8-9, 10-11 or 12-13 yrs. Cost £12 (style may vary site to site). Use of our Forest Shelter. An hour in our shelter where you can lay out a picnic.